Your luxurious car is thought to be reliable, trusted, and high quality. At BMW of Bloomington, we know how important it is to keep up appearances-especially with your automobile. So, when you’re looking for a new vehicle with clean lines, top-notch technology, and legendary status, search no further than your BMW dealer in Illinois, BMW of Bloomington. More than just a Bloomington car dealer, we offer a full-service dealership experience, from buying to long-term ownership. No matter what you need during your car-buying journey, our team of professionals will quickly consult you and get you equipped with comprehensive financing and service. With our assistance, you’ll confidently drive down the roads of Bloomington, Normal, and Champaign behind the wheel of a ride that’ll keep heads turning. Regardless of your aesthetic preferences, our showroom makes it clear why drivers choose us as their BMW dealer in Illinois. From the energetic BMW X3, the agile BMW 320i, or any of our other luxurious models, you’ll discover the option that perfectly suits your unique tastes. Thanks to our extensive inventory, you’ll be furnished with a sedan, SUV, or anything in between, that’s decked out with an array of high-tech features and plush materials. So, if you’ve been looking for a car dealership in Bloomington that can match you up with an exciting new sedan, a spacious new SUV, or just an elegant new ride, you’ve come to the right place. On top of that, our team offers up a selection of certified pre-owned automobiles that come with thorough inspections. That way, you’ll soar down the road knowing that you’re seated in the throne of a vehicle with the power and reliability you need. After you’ve chosen the BMW vehicle that’ll help you enjoy every minute of your ride, you can count on our BMW finance experts to fix you up with a buying or leasing plan that aligns with your lifestyle. First, our specialists begin by sitting with you to discuss the intricacies of your budgetary requirements. Next, we’ll design a payment plan with those needs in mind. With our assistance, you’ll drive away from our dealership knowing that you scored fair loan options on your automobile. Want more information on the trade-in value of your current car? Visit our Value Your Trade page and enter details about your vehicle. Once you submit, you’ll be presented with the approximate worth of your automobile. To ensure that your classy road warrior continues to perform smoothly, it’s essential to have access to a state-of-the-art BMW service center. That’s why our BMW dealership comes equipped with a cutting-edge repair center and a squad of trained technicians. So, whether your car requires a routine checkup, an unexpected repair, or anything else, our knowledgeable professionals will work hard to get every job done right. Reserve your next appointment by heading to our schedule service page. VISIT YOUR BMW DEALER TODAY! As a BMW dealer in Illinois, we believe that you deserve an automobile that’s just as elegant as you are. And from the second you step into our dealership to the moment you drive away in your new BMW, we’ll support you with top-notch care and attention-to-detail. 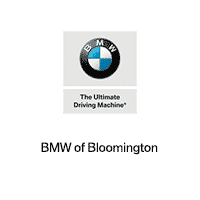 When you’re ready to get your hands on an upscale vehicle for the roads of Bloomington, Normal, and Champaign, stop by BMW of Bloomington and see why we’re a favorite Bloomington car dealer — or give us a call today!